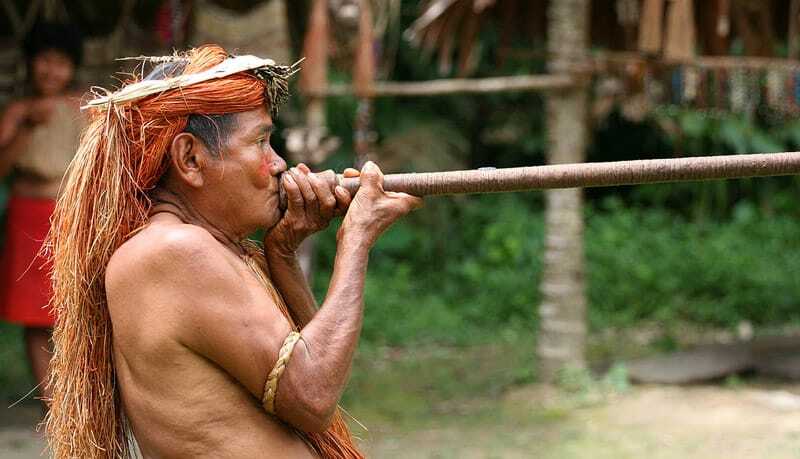 The blowgun is a primitive weapon that has been around for many centuries. It’s silent and will never alert your hunting target. Unlike a bow, blowguns can only hunt small game. Aside from that, the fact that you can easily make a blowgun from the items lying in your household is all the more impressive! 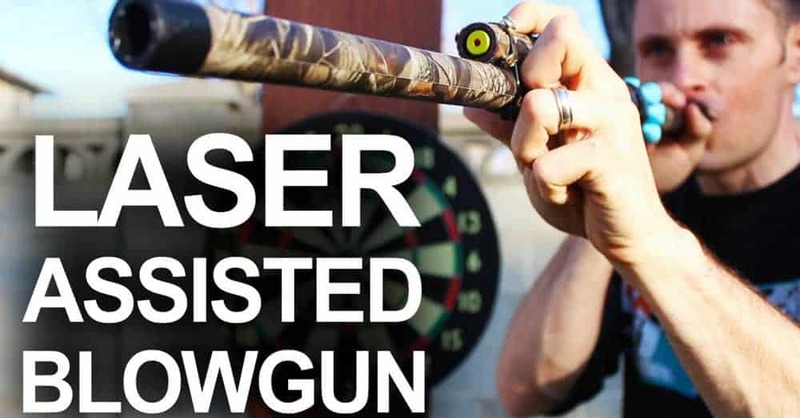 Learning how to make a laser assisted blowgun could make all the difference in your daily life. Commercial blowguns are sold for more than $20. Why spend that amount of money when you can do it yourself for less than $5? In this article, we will show you how to make a blowgun that you can be proud of. As mentioned previously, blowguns were used by traditional tribes as weapons to hunt small animals such as rabbits. Indeed, blowguns are effective projectiles to fire shots using one’s breath. This means that the penetrating force of the blow darts depends on their weight and someone’s lung capacity. The projectile weapon consists of two parts: the long tube where you blow through and the darts that are blown. Traditionally, the tube or the pipe was made from saplings that have hollow insides. The perfect example here is the bamboo. They are durable and lasts a long time. As innovations were underway, people who make blowguns now use PVC pipes. These plastic pipes are commonly seen in the house and don’t cost much when you purchase one in hardware stores. The blow darts before were made of bamboo skewers and wood splinters. Some even used seeds and small pebbles. As blowguns were weapons in the old days, people would coat the tips of the darts with poison to effectively paralyze or even kill someone with just one shot. Blowguns are not toys. If you’re not a hunter, don’t aim the blowgun on a small animal. Not even to a person unless it’s for self-defense. As blowguns are dangerous and even lethal if laced with poison, use one for target shooting. You can effectively improve your accuracy with just paper targets or the like. Furthermore, before constructing a blowgun, make sure that you don’t violate any local laws that may prohibit you from using it in public. 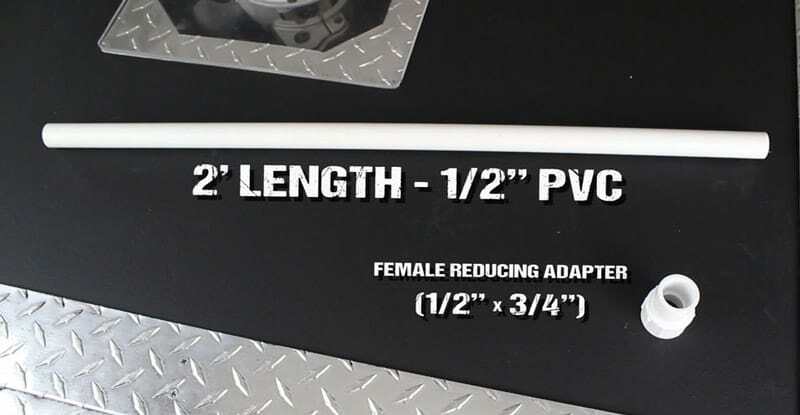 Take a half-inch PVC pipe and determine the length that will make your tube. Consider a length that you will feel comfortable carrying around. If you want it longer, the darts can travel faster because of the stored energy. 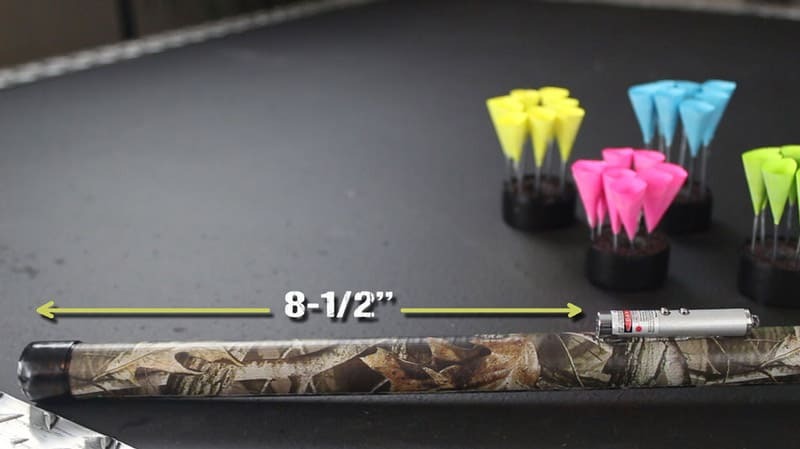 This greatly improves the power and accuracy of your blow darts. However, don’t make it too long that the PVC pipe itself will begin to bend. Once you take a length, saw it off. Time to insert an adapter from which will be your mouthpiece to blow those darts away. 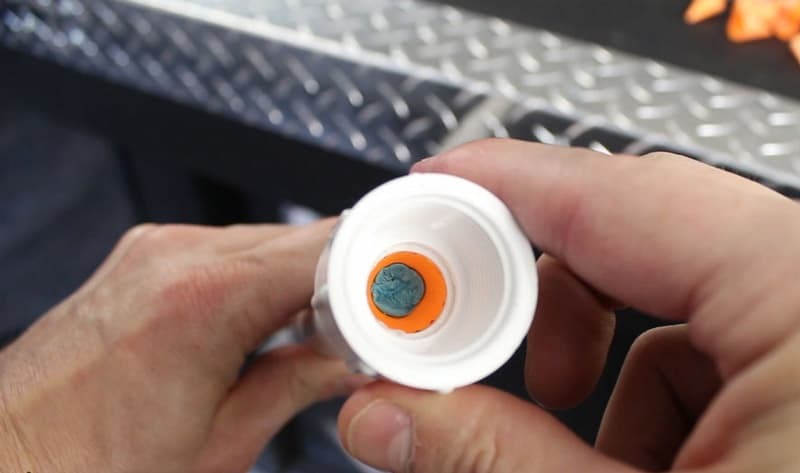 Using a reducing coupling that is ½-inch in diameter on the smaller side and 3/4-inch on another side, insert it to the one side of the PVC tubing then to secure it in place, hammer it down until it is tight. To give the blowgun a more sophisticated look, you may place a conduit coupling on another end of the tube but don’t finalize the placing as of yet. You will use that end to make sure your darts will fit inside of the tubing. 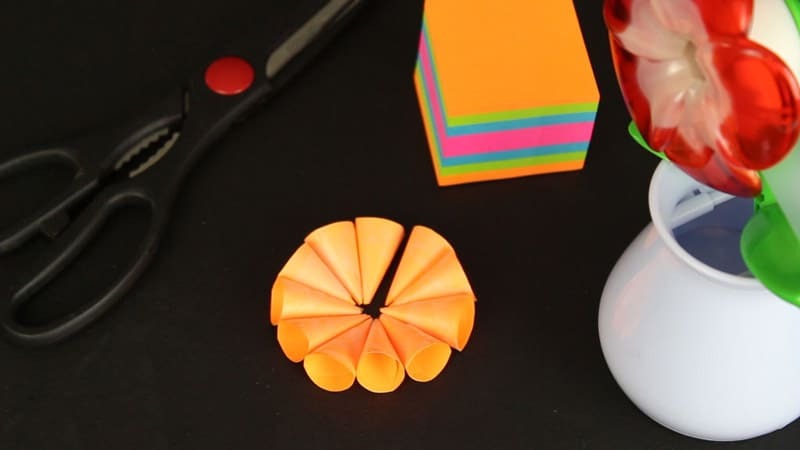 Cut out square-shaped papers or just use a pad of sticky notes. The more colorful it is, the better. Next is to make cones out of paper that is uniform in diameter. You may use a material in your home that is cone-shaped and make it as a template for the cut-outs. The perfect example here would be a party hat. After making a cone, secure it with a tape. Do this repeatedly until you have an enough quantity. Next step is to make sure that the darts will fit inside the ½-inch diameter blowgun barrel. Take one cone and carefully squeeze it in. Of course, not all of the cone will go inside, and the markings outside will show this. Take the cone out and using scissors, cut it horizontally reducing the height of the cone. Do this with the other cones. 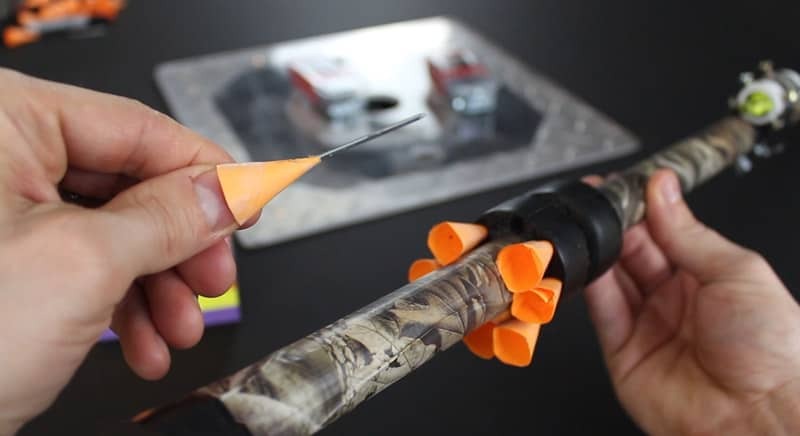 Next step for your blow darts is to decide if you’ll make harmless blow darts or make true darts that will stick on the surface once released. 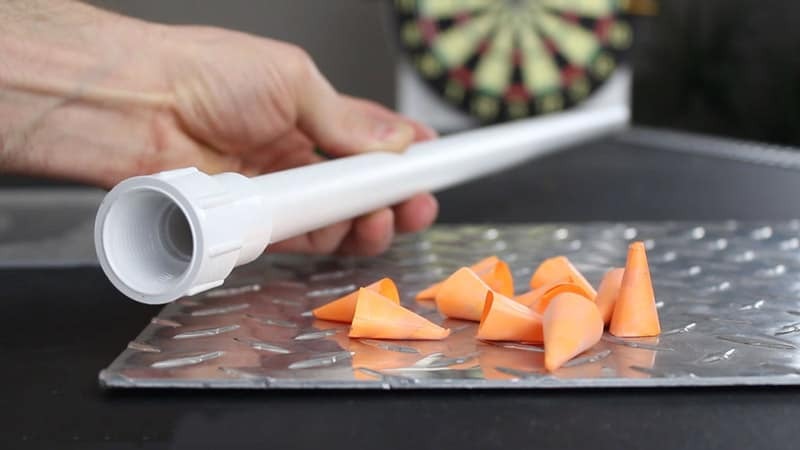 To make harmless blow darts, you will need to put some weight on your lightweight paper cones. Weight is important to ensure that your darts will travel flawlessly from one side to another without falling first. Squeeze in a crumpled paper inside the paper cone and push it back to one side. Do this repeatedly with the other cones. 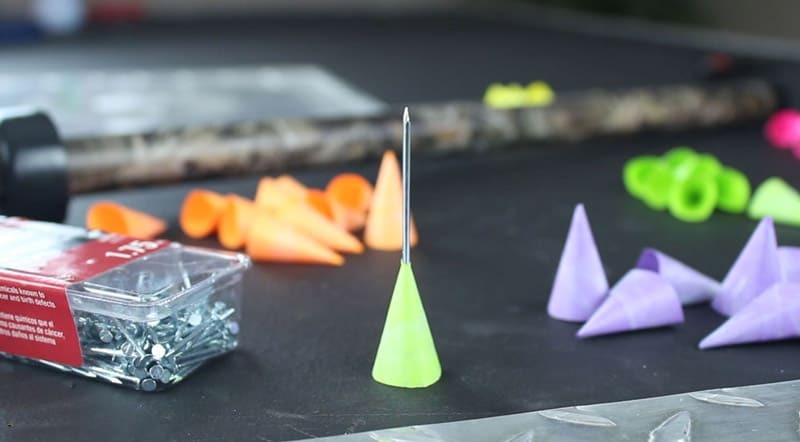 If you want the quickest method, take a glue gun and pour melted glue into the cones in a lined position. Make sure the quantity is uniform. Voila! You now have harmless blow darts. Another category of blow darts is to make the ends as sharp to make it stick like true darts on wooden or concrete surfaces. To do this, you need nails that have flat heads and are light in weight. You can make it longer or shorter depending on your preferences. The longer one has more penetrating force while the shorter one can travel very fast. Using a perfect cone, insert the nail inside and push it back until the tip of the cone touches the flat head of the nail. Do the same with the other cones. Don’t stick with just one length and make darts of varying lengths. Strengthen the nail darts by pouring in melted glue inside and let them harden. Test fire one dart so you know if your nail dart is a success. There’s another variety of blow darts available. They are called glass breakers. They are called such that because they have bigger surface areas than nail darts that are narrower when shot. Using a flat screw with a flat tip, make a glass breaker by fastening the screw with the tip of the dart being the flat head. Once your darts are set, the next step is to design your blow gun. 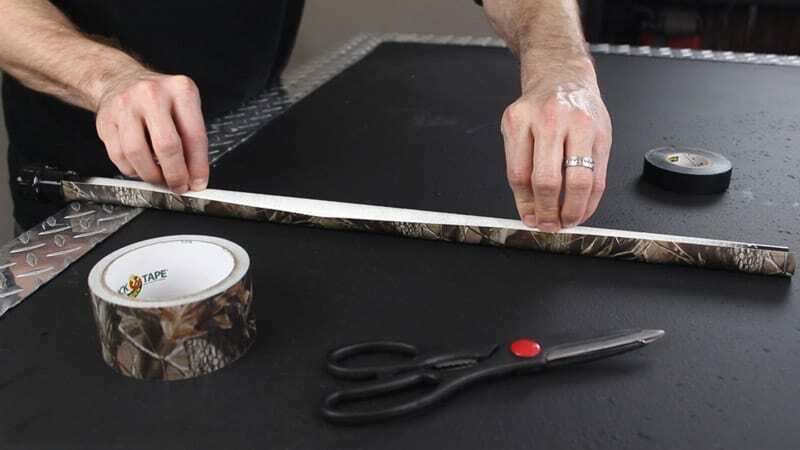 Prepare a tape that has your preferred design that is very stylish. Cover the entirety of the blowgun save from the ends with couplings with the tape. Next is to use an electrical tape to cover the couplings to create a more professional and stylish look. The next problem would be how to store your darts without picking them from your pocket. The best solution would be to attach it directly to the blowgun, right? Get a foam pipe insulation that is also the same diameter with the blowgun barrel. That would be the makeshift quiver for your darts. Cut two donut shapes from the foam pipe. Now we need to make holes to store the darts properly. Heat a metal tubing with the appropriate diameter and drill holes into the one foam. 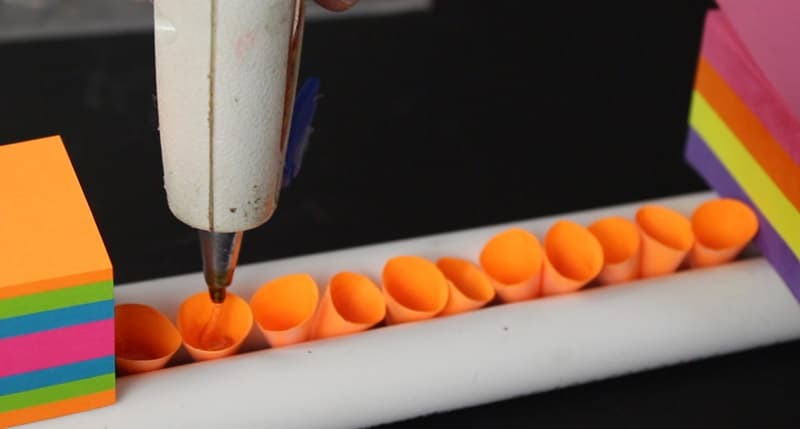 You can make holes fit for eight darts at most. Fit the two donut foams halfway through the blowgun barrel and secure it in place. You can now use the quiver made of foam for your ammunition. What makes this blowgun very modern is that you can use a laser pointer to be your scope for improved accuracy and sighting in the dark or low light. Laser pointers are easily accessible, and you can purchase one for more or less $1. The task now is to attach the laser pointer to the top of your blowgun barrel. The temporary fix is to tie it and secure with cable ties. They are easily removed once your laser pointer runs out of batteries. Now is the time to finally put your blowgun to the test! Insert the dart beforehand and take a deep breath. Blow the darts into a hard surface preferably wooden or concrete. You can also use foam dartboards so you can quickly remove the darts just like the dart game. Since the darts have sharp points, you can assure that they will stick and depending on the material of the target, they can penetrate deeper. With glass breakers as darts, you can effectively shatter glass because the point of contact is much bigger than the nail darts. Now that you learned how to make a laser assisted blowgun, you can have fun while in the backyard and also improve your shooting and accuracy skills. There’s no mistaking that blowguns are cheap alternatives of bow and arrows when it comes to target shooting, and you don’t want to miss that chance.